SIGMA APO MACRO 180mm F2.8 EX DG OS HSM, a high-performance large aperture telephoto macro lens. This is the world first 180mm 1:1 Macro lens incorporating Sigma’s original Optical Stabilizer (OS) function with a maximum aperture of F2.8. Its construction includes three FLD (“F” Low Dispersion) glass lenses and a floating inner focusing system for exceptional correction of aberrations that enable this lens to photograph objects accurately throughout the entire focusing range. As a flagship telephoto macro lens, it achieved a uncompromising high rendering performance. Use of three FLD (“F” Low Dispersion) glasses that have a grade equal to fluorite ensure exceptional axial chromatic aberration and lateral chromatic aberration correction. An inner floating focusing system moves two different lens groups in the optical path to different positions. This system helps couter the astigmatism and distortion and provides extremely high optical quality result from infinity to 1:1 macro. The overall length does not change during focusing, which is convenient for handling. Metal parts are used in the lens barrel to ensure high durability. 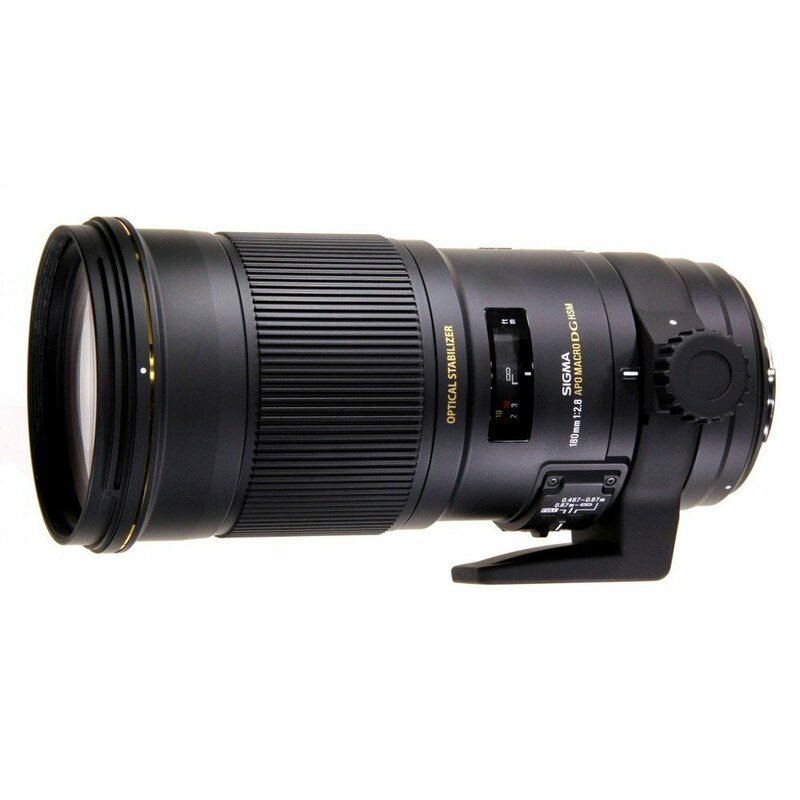 This is the first 180mm optically stabilized telephoto macro lens in the world. This OS offers effective correction of approximately 4 stops. The system works for camera shake even in the macro range photography. Though the effectiveness of OS will gradually decrease as the shooting distance becomes shorter. This is the first 180mm telephoto macro lens in the world with a reproduction ratio of 1:1 and offers a maximum aperture of F2.8. The enables photographers to emphasize the subject and provides a bright viewfinder. It also helps to produce excellent bokeh. Super Multi-Layer Coating is used to to achieve high rendering on this flagship lens. The flare and ghosting were thoroughly measured from an early stage to establish an optical design which is resistant to strong incident light such as backlight. The Super Multi-Layer Coating reduces flare and ghosting and provides sharp and high contrast images even in a backlit conditions. The hood adapter extends the length of the lens hood and provides more effective shading to block out extraneous light which may have a harmful influence on the lens’s rendering performance. Using the APS-C Hood Adapter HA780-01 with digital cameras with Full Frame image sensor may result vignetting. Please remove the hood adapter if you are using it in Full fame Cameras. This lens incorporates HSM (Hyper Sonic Motor) to ensuring high speed and quiet AF as we as full time manual focus capability. For added accuracy and durability this lens incorporates a brass made bayonet mount. A special treatment applied to it’s surface to reinforce its strength, giving it greater strength and making it highly resistant to long-term use. Its 9 rounded blade diaphragm produces an attractive round blur to the out of focus areas or bokeh effect of the image. Min Focusing Distance 47cm / 18.5in. Dimensions (Dia x L) 203.9mm / 3.7in. x 8.0in. Notes Nikon mounts do not have an aperture ring. Some functions may not work depending on the camera model.